Yeah, yeah, health nuts, we know, we know. Hands are the dirtiest part of our body — turning doorknobs, flushing toilets, shaking hands all day in a hot, neverending exchange of sweat, grime, and bacteria. And yes, those germs form tiny Ewok Villages in the cracks of our palm and corners of our fingernails and leap at any opportunity to settle down in a new home. Germophobes of the world, we hear your warning. But we can’t heed your warning. 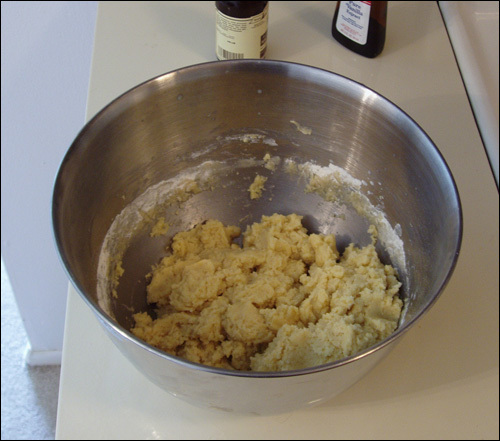 No, we can’t help it, because squeezing the daylights out of raw cookie batter with our bare hands is too big an enjoyment and too effective a technique to pass up. Sure, some of us start with good intentions — mixing patiently with a fork as raw eggs slide everywhere, butter clumps up, and big flour towers stand tall on the sides of the bowl. But even those folks hit a wall eventually and just toss the fork in the sink, roll up their sleeves, and dive right into the batter fingers first. Yes, we squeeze and squeeze and squeeze that cold, wet mess and press it out through our fingers like a Play-Doh Spaghetti Factory. We squish butter up, rub flour in, and fold those chocolate chips in there good. When we’re done, sometimes we lick each of our fingers and get raw cookie batter all over our chin. But after it’s all over we slop those blobs on a baking pan and throw them right in the cooker for some fine tastin’. i love reaching right into the cookie dough! i also end up eating a lot of it that way, haha. That’s why I love baking! don’t worry about germs; you’re sliding it into a 400 degree oven. Yaaaaay! You actually cook the cookie dough? I rarely get that far. Fun With Teens: Making marshmallow fondant cake frosting. This is the hit teenage version of messing with cookie dough. Why? It is incredibly, unbelievably, insanely messy, sticky and sweet. And it generates laughter in the kitchen, piles of it, from the teens no less. Pour a large bag of marshmallows into a bowl with a few tablespoons of water into the microwave for 30 seconds (x2 or 3) until you have a nice foamy mush, dribble the mixture onto a large bag of powdered sugar that’s been dumped on the tableand mix with your hands (no utensil will do) until you reach a smooth, stretchy dough that can be kneaded. Watch a youtube video to get specific instructions. Don’t wear dark suede shoes because the powdered will be flying. The teens have never been allowed to participate with permission in such a messy undertaking…and afterwards the finger licking is awesome. Later, when it’s all rolled out and topping the cake for that satin smooth finish, you’ll feel like a team of professional bakers. That’ll put some dough in your pocket.. Har Har! I like how the robotic toys fellow is doing a report on mixing cookie dough with your bare hands. The Robomatic Dough Mixer 8000 will be unveiled next month. You better see a piece of that action, Neil!! Good one! I was tempted to comment on that guy, but thought I’d wait to see if Chad took a shot at it. I wouldn’t eat it even if it was made with my own hands. If you like mixing cookie dough with your hands, try doing up your meatloaf the same way. It’s awesome! I haven’t thought about Ewoks or mixing cookie dough with my hands in a long time. Thanks! Cookie dough is better, though. can i just tell you how happy i am that this one is on the list? the first thing i saw on the page? COOKIE DOUGH!! LOVE THIS! When I was 9 years old I made a batch of brownies. The box said “stir by hand.” So that is what I did: stuck my hands in there to mix up the ingredients. Of course it is kinda hard to get the sticky gooey stuff off, and get it into the baking pan. My mother came into the kitchen and could not stop laughing. It’s a family legend to this day, 30 years later. You don’t have to worry about germs if you wash your hands before you commence with the deed, LOL! I love rolling the dough into balls to make the cookies. I love the awesome things put on this site… Except this one. I find doing this to be gross and oily. Bonus, bacteria is no match to that Big, Hot Fiery Oven!! Total awesome!! I just hope that who ever does that at least washes there hands before mixing the batter..